There are a million bugs out there and well, most of us are bound to get bitten at least once in our lifetime. Different bugs have there own stings of varying degrees of pain and potential level of risk to human life. It would be better to stay away from these nasty bugs as they say, prevention is better than cure.But the outdoors reckons us to enjoy what nature has to offer. We just have to be cautious though since the bugs are also out there. For a start, before you bask under the sun, make sure you wear light colored fabrics and avoid printed florals as they are attracted to these prints. 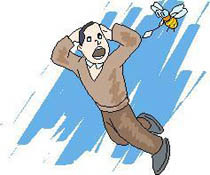 Do not be agitated when you hear a buzz and see a bee flying around. You will just attract more attention. Also, don’t wear too much scented perfume or colognes as the bees or bugs might mistake you for a flower. If for instance a bug has decided to put a sting on you. Errr, sting you in short, just go to the kitchen and you will likely find some natural remedies available.